A variety of small wristband devices that connect with your smartphone have been released recently that track your fitness objectives, your activity and how much sleep patterns. The devices are designed to be worn all the time, and track the number of steps, distance travelled and calories burned, compared with targets set using Bluetooth, or other connections, and apps to set goals and monitor progress. This is done through a set of LEDs in a line display, or numbers to indicate your progress towards your goal or target. 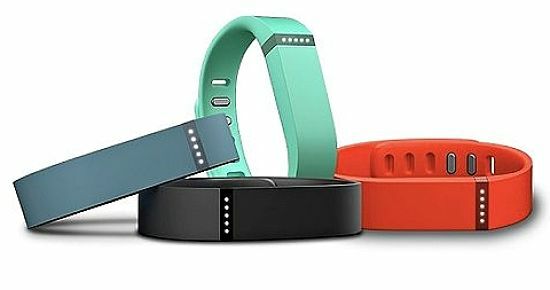 This article reviews the three best wearable devices that are currently available: Fitbit Flex, LarkLife, Nike+ FuelBand and Jawbone UP. The Fitbit Flex is a small wristband type device that is worn all the time and it keeps track of your steps taken throughout the day, total distance travelled, estimated calories burned through exercise, and how much sleep you get each night. Unlike many of the other devices listed below the band is water and sweat resistant. Combined with the sleep cycle monitor is a vibration alarm to silently wake you up each morning. The Fitbit Flex lacks a time display similar to the one for the Nike FuelBand, the Fitbit Flex has a very good interface with smartphones via Bluetooth and includes an app to monitor progress, set goals and get comprehensive data displays. The displays on the wristband are limited to a single set of five indicator lights. These indicators can be used to display progress towards a specified goal such as the target number of steps (such as walking 10,000 steps in a day). While the Flex display is very limited it is designed for continual interface with a smartphone and the connection and apps are excellent and work very well. 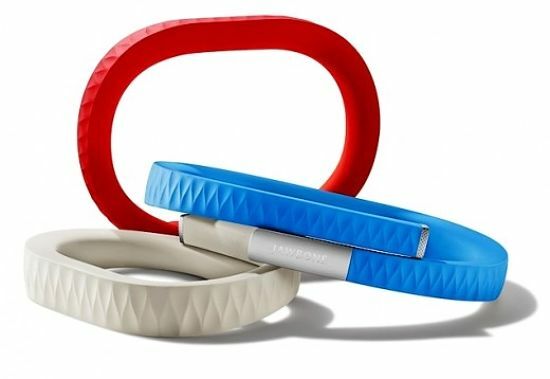 The Jawbone’s Up band can not upload the data collected on the band for analysis until you take it off and connect it to the phone’s headphone jack. The Nike band displays a lot more information on the band itself and it can make transfer via Bluetooth, but it does not monitor sleep. The first Lark wristband that was introduced was specifically designed to monitor the length and quality of your sleep, and sleep patterns. The new Larklife device adds activity monitoring. While the device does a good job with counting footsteps, distance traveled, etc., the interface and app is clumsy and far too complicated. There are in fact two wristbands, one for daytime activity monitoring, and one for sleep monitoring. You have to keep both of them charged up to get the full monitoring. 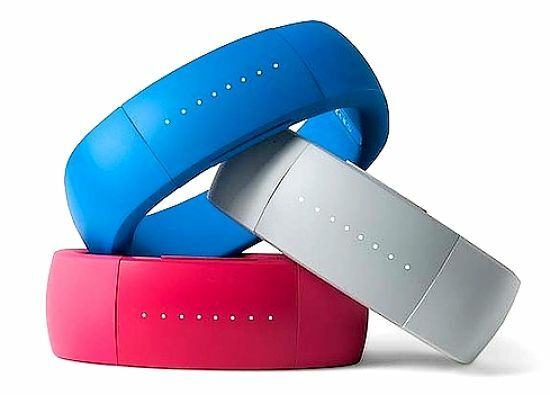 The blue activity monitoring band is quite large, and bigger and thicker than the other bands discussed in this article. The Larklife only works with Apple's iPhone, but and Android version of the app has been promised. Unlike the Jawbone UP, the Larklife transfers data from devices to the app using a wireless connection. One weakness shared by all the devices is that it does not monitor other activity that does not involve steps, such as bike riding, weight training or many gym workouts. Automatic detection and monitoring of activity periods. There is a time delay before the data can be viewed on the app. Overall, many may prefer Fitbit One or Jawbone UP, both of which track activity and sleep patterns with the same wristband , and which have better diet tracking using a food diary. This is an older device that does not require constant interfacing with a smartphone. 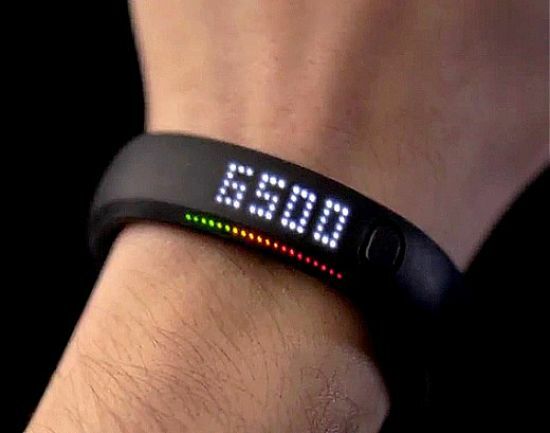 You can view your progress instantly on the wristband display that includes: time of day, number of steps, estimated calories burnt, Nike Fuel points, progress towards a goal. It does have a wireless connection to an iPhone or through a USB port to a computer for recharging the battery (one charge lasts 3-4 days). The FuelBand automatically resets at midnight for counting of steps and activity. One disadvantage is that the band is not waterproof and so cannot be worn while swimming or in the bath or shower. You can't track individual exercise session - you only get a daily graphs showing total hours and data. Nike does have other ways of doing this with other devices. The Fuelband has no diet tracking, nutrition or weight variables that are provided by Fitbit or SLIMCOACH. The calories burned and distance travelled are only estimates, and can't be calibrated. This devices does not have a Bluetooth connection and so you have to connect via the headphone jack of the iPhone. There are no displays of the wristband itself. Because of the lack of Bluetooth, you can only see your data after connecting and uploading the data to the smartphone. The device tracks your activity, including: steps, active time, distance covered, idle time and estimated calories burned. You can also monitor your eating patterns and your diet, which is fully featured, unlike many of the other wristband monitors. The sleep quality monitoring function is very good, allowing deep sleep, time awake and light sleep to be tracked in detail. The major disadvantage is that the band only displays a flower (for day time use) or a moon (at night and for sleep tracking). You can switch between these modes. The activity tracking is equivalent to the Fitbit tracker. But it does not include speed, heart rate data or other details required or training. You can review past days. The UP app is easy generally easy to use. It includes charts and graphs despite only being a smartphone interface device. The Idle Alert function is a good tool for reminding you to get up and active. The major one is the lack of any on-writs display like that available on the Nike+ FuelBand and to a limited extent on the Fitbit waistband. It does not have training system functions for those who want to track their heart rate, speed and other performance data.